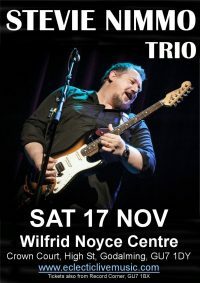 The Stevie Nimmo Trio will be performing at the Wilfrid Noyce Centre, Godalming. The elder brother of the fabulous Nimmo Bros has been wowing audiences across Europe with his excellent trio. Great musicianship and great original songs, all delivered with soul and passion.